About a year ago, I was at the checkout line at Molly Stones, and this brightly packaged candy bar wrapper caught my eye. 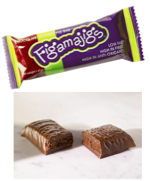 Normally I would have ignored it, since I don't eat candy bars, but I noticed that the name of the bar, Figamajigs, began with the word Fig, so I decided to take a look. The package pleasantly surprised me - the bars were all natural (no high fructose corn syrup or hydrogenated oils), low calorie, had figs in them, and also were made with dark chocolate -- seemed like a good healthy choice. I personally love figs -- they are sweet, filling, and full of fiber (making them a great choice for diet), and they have have protective health properties. I also really enjoy eating chocolate as well, like most people I know. In particular, I ADORE dark chocolate, since it not only fulfills my chocolate cravings, but it is also known to be more healthy than milk chocolate, since it has antioxidants in it, which are believed to help lower blood pressure, and help protect against heart disease. So, Figamajigs ended up scoring really high on my label test, but you are probably wondering if they taste as good as they sound. The answer is Yes! They are delicious. In fact, these are much more of a sweet, delectable, chocolaty, candy-like treat, than most of the other bars that I eat and are much better as a snack or dessert than they are for breakfast. In terms of sweetness, they actually remind me a bit of the bars that WW sells, but they contain much healthier ingredients. The Figamajig bars come in a few flavors: dark chocolate covered fig (2 WW points, 130 calories), dark chocolate covered mint (2 WW points, 130 calories), dark chocolate covered raspberry (2 WW points, 130 calories), and dark chocolate covered almond bar (3 WW points, 150 calories). My personal favorite is the plain one. These figs and chocolate give the bars such a strong taste that the extra flavoring isn't really needed to make them yummy (although the flavored ones are really good, and the crunch in the almond one is nice!). So, I buy these bars at my local Molly Stones. I see on the Figamajig site that they are also available at some Targets. Additionally, here is a link to some other bars I've blogged about that I think are both tasty and full of good ingredients (including the super yummy Fiberful Bar (0 WW points), Gnu Foods Bars, Fruitabu, Attune probiotic bar, Clif Z Bars, and Luna Tea Cakes).